SfDataGrid provides support for view filtering. SfDataGrid provides support to filter the records in view by setting SfDataGrid.View.Filter property where Filter is a predicate. In order to filter the records in SfDataGrid, you have to assign the filtered strings to the ViewModel.FilterText property which will be later applied in Filter predicate that is assigned to SfDataGrid.View.Filter in OnFilterChanged() method. To update the filtering for the newly added row or column, set the SfDataGrid.View.LiveDataUpdateMode to LiveDataUpdateMode.AllowDataShaping. The following code example illustrates the delegate, properties, and methods used in the ViewModel class in order to perform the filtering operation. 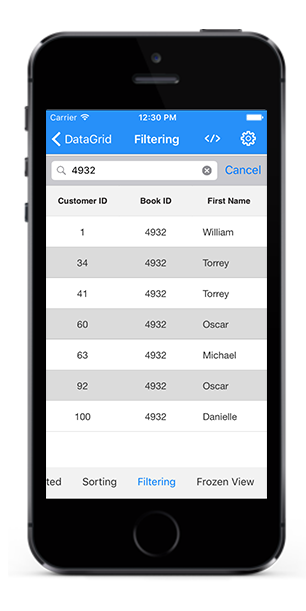 The following code example illustrates how to create a UISearchBar and apply the filtered records to ViewModel.FilterText property in SearchView.QueryTextChange event. Once you create a UISearchBar and a view model, you can perform filtering by setting SfDataGrid.View.Filter property. You have to call the SfDataGrid.View.RefreshFilter() method after you set the filtered records to the SfDataGrid.View.Filter property as like in below code example. viewModel.filterTextChanged = OnFilterChanged; //where ‘filterTextChanged’ is a delegate declared in ViewModel class. You can filter the records in all the columns or in particular column using the codes in the below code example. For example, you can filter the records in OrderID or any other particular column alone.The following code example illustrates how to create an option view to select a column and a condition. Also, it illustrates how the records will be filtered based on the column and the condition selected. In addition to the column based filtering, you can filter the records based on some conditions. For example, you can filter the records based on the input you given or you can filter the records contrast to your input. You can achieve the condition based filtering for all the columns or any particular column. The above conditions are the mostly used conditions. However, you can add any other conditions based on your requirement and alter the below code example based on your condition. SfDataGrid allows you to clear the applied filtering by setting the SfDataGrid.View.Filter property to null. The below code example illustrates how to clear the applied filtering in SfDataGrid.